Consumerist reader Dave says he hasn’t rented anything from U-Haul in around two years, so he was surprised this morning to receive a text from the company. Even more alarming: The message said he owed U-Haul money for a speeding ticket from three years ago. Thinking, with good reason, that the text might have been a phishing scam — someone posing as U-Haul hoping he’d be gullible enough to provide payment info on the spot — he called the rental company to see what was going on. That’s when he took to the U-Haul Facebook page — albeit in all capital letters, which we generally advise against — to register his complaint in a more public forum. 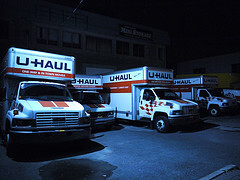 This post did get some response from U-Haul, which has since contacted Dave by phone. If U-Haul is going to go after customers for ancient speeding tickets, it should at least have the courtesy to be able to provide documentation to back up the claim. I wanted to update you and the Consumerist as to David’s Situation. We have been in contact immediately after receiving his message on Facebook, and have cleared up the matter of the amount being owed while we work with the City of Philadelphia to sort out the reason for delay in notification. As far as our process, we notify our customers as soon as we receive a citation through an automated system. The system will notify the customer via the forms of contact we have on file for them such as email, text or mail. We received this specific information for the citation on Feb 1st which is what prompted the chain of events. We are currently working with the City of Philadelphia to determine why we did not get the information sooner to prevent similar occurrences from happening. In response, we have asked U-Haul why it would pass on the charge for this ticket, even if valid, when it appears that the statute of limitations has long-since expired. 5553. Summary offenses involving vehicles. (a) General rule.–Except as provided in subsection (b) or (c), proceedings for summary offenses under Title 75 (relating to vehicles) must be commenced within 30 days after the commission of the alleged offense or within 30 days after the discovery of the commission of the offense or the identity of the offender, whichever is later, and not thereafter. b) Minor offenses.–(Deleted by amendment). (1) Where proceedings are timely commenced against a person reasonably believed to have committed the summary offense or offenses charged and it subsequently appears that a person other than the person charged is the offender, proceedings may be commenced against the other person within 30 days after the identity of the person is discovered and not thereafter. (2) Proceedings for summary offenses under Title 75 may be commenced within 365 days after the commission of the offense, the discovery of the commission of the offense or the discovery of the identity of the offender, whichever is later, and not thereafter if the offense involved an accident resulting in the bodily injury or death of any person. (3) Where a police officer reasonably believes that there are multiple summary offenses arising out of the same conduct or the same criminal episode and that an offense under 75 Pa.C.S. § 1543 (relating to driving while operating privilege is suspended or revoked) has occurred, proceedings on all summary offenses arising from the conduct or episode may be commenced at the same time and must be commenced within 30 days after the commission of the alleged offenses or within 30 days after the discovery of the commission of the offenses or the identity of the offender or within 30 days after the police officer receives verification of the basis for the suspension from the Department of Transportation as required under 75 Pa.C.S. § 1543(d), whichever is later, and not thereafter.